If you weren't aware, last year we launched an updated FantasyPros Chrome Extension. The extension lets you view FantasyPros player cards on any website where player names are mentioned. For Yahoo leagues, it shows you weekly ECR and our projections for players in your weekly matchup (very helpful for start/sit decisions and as another data point). FantasyPros ECR and projected points in Yahoo! Fantasy Football. Neat. For our ESPN league users, we ran into a small hiccup. ESPN changed their draft room at the beginning of fantasy football season. 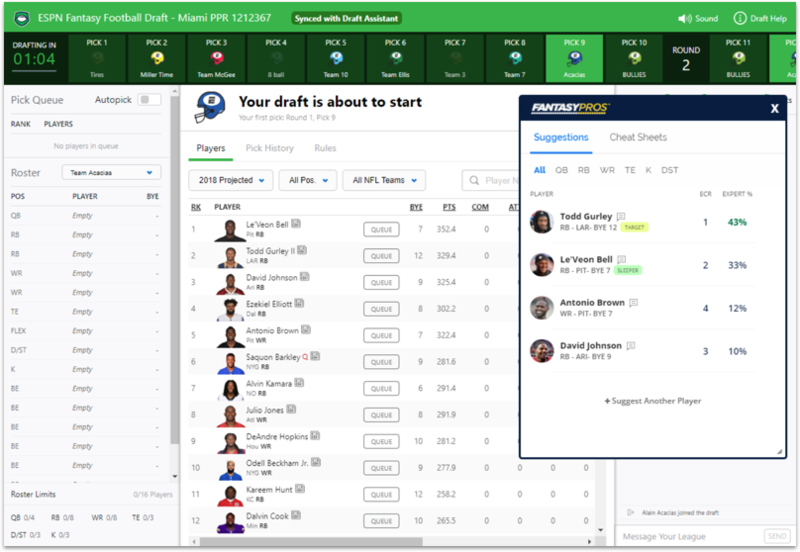 This means that you need to have the FantasyPros Chrome Extension installed, and be using the Chrome browser for your ESPN draft, in order to utilize the Draft Assistant for live expert advice during your draft. However, with this change we've added a really exciting new update. With the FantasyPros Chrome Extension we now have what's called the "Side Assistant" INSIDE your ESPN draft room available to all FantasyPros premium users. INSIDE? Yes. INSIDE. With the Draft Wizard ESPN Side Assistant you will see expert suggestions and cheat sheet (with draft pick tracking) in the same browser window! No more switching back and forth or using a side by side browser setup. Those of you with higher resolution screens will have the side assistant docked to the righthand side of your browser window. If you have a slightly lower resolution the side assistant will be moveable and size adjustable, and will overlay part of the draft room. Install the Chrome Extension now to get the ESPN Side Assistant (premium users only) and FantasyPros player information on all websites.